The picture in the ad looks so happy, so innocent. 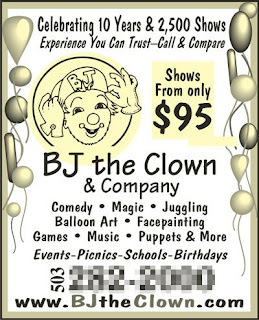 But I don't know...I'm just not sure I would want a clown with the name "BJ" to entertain my kids. For some reason, this depresses me. Hahaha....I wouldn't have particularly thought of the BJ thing without your comment. Too true! !